Creating a collage of pictures is definitely an exciting and challenging task! At times mind boggling too, some mathematics needed. I simply love doing it. My first collage was created in October, 2006 and had been a steep learning curve through trial and error! Hmm…it does get easier and prettier with more practices indeed! :D A collection of my photo collages is stored at my Flickr site, if you’d like to browse. I have received a few requests on how to create one, so here’s sharing a photo montage tutorial especially for my wonderful gardening friends at Moosey’s forum and Flickr mates, as well as those interested. 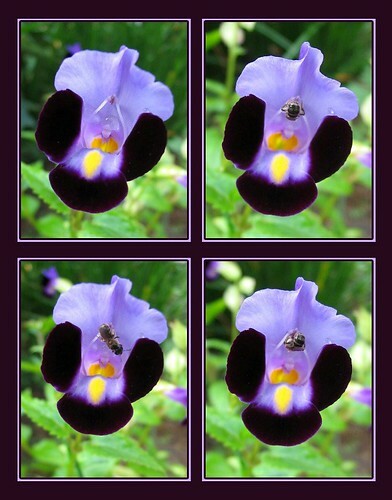 As an example, I’m using this collage of 4 Torenia Fournieri photos, taken from our garden. Steps on how to create a collage, using Adobe Photoshop CS2. Start of with a rough sketch of how you want your collage to be. This is a set of 2 x 2 images. Each image will be 445 x 575 pixels with a 30 pixels margin between and a border of 45 pixels enclosing it. So the photo collage should measure – width as 1010 pixels (i.e. 45+445+30+445+45 pixels) and height as 1270 pixels (i.e. 45+575+30+575+45). Using Microsoft Office Picture Manager, do all the necessary adjustments as you’d want for the end result to each of the 4 images selected. Tip – always process on photo copies, never use originals. In this example, each image was resized, then cropped to 430 x 560 pixels. Next, I’ve added a dark-colored photo frame using Adobe Photoshop (see photo-framing tutorial link here), with an increase of 15 pixels in width and height. Thus each finished image was finally 445 x 575 pixels. Framing is really optional here, though it did create a lovelier finish in this collage as seen. You can now proceed to create the collage using Adobe Photoshop CS2. Choose File > New – to create a new blank image. Specify image size as desired on a transparent background. In this example, it was 1010 by 1270 pixels as width and height respectively as stated in Step 1. Resolution should be the same as that of images to be pasted (this can be checked earlier by opening one of these images in Adobe Photoshop – choose Image > Image Size). In the Layers Palette, double click the words Layer 1 and rename it Collage. Choose File > Open – to open the first image (Image 1) that’s to be added to the collage image. Place the opened Image 1 window to the right side of collage image window. Select the Move tool. Click anywhere on the Image 1, hold and drag it to the collage image window and release the mouse button. Note that Image 1 is now displayed in the collage image and it is also on a new layer called Layer 1 in the Layers Palette. Use the Move tool to position Image 1 as desired in the collage. Close the Image 1 window. Now only the collage image window is open and its Layers Palette now shows a Collage layer that you’ve renamed and Layer 1. You need to do the same for the rest of the 3 images to be added to the collage image. For each image, repeat steps 4 through 6. Note that the added Images 2, 3 and 4 are on corresponding Layer 2, 3 and 4 in the Layers Palette. A final check to see whether the images are positioned as desired in the collage. Otherwise, reposition them. In the Layers Palette, click once on the layer that you want to adjust, to target the layer. Reposition with the Move tool. Before any changes are made to that layer, always make sure that the correct layer is targeted in the Layers Palette. Next, you may want to highlight each image to further enhance its beauty. In my example, I have applied the Stroke style to each of the 4 images, extracting a light lavender color from the flower petal with the Eyedropper Tool. This is the simplest way to add a border or frame to your pictures. In the Layers palette, click on Layer 1 and on the icon for ‘Add a layer style’ found at the bottom of palatte, then choose Stroke. In the Layer Style window, make your desired choices of size and color, and see that Preview is selected to enable viewing of selections on Collage image window simultaneously. Hit the OK button when done. Finally, color the collage background. In the Layers Palette, click on the Collage Layer to initiate coloring. Choose the color that you want with the Eyedropper Tool, whether from the color chart or from the 4 images added to the collage and then use the Paint Bucket. If you change your mind, delete mistake in your History Palette or just hold down Ctrl key and Z or choose Edit > Undo Paint Bucket or Step Backward, and start all over. Here, I’ve chosen a dark color (to contrast pleasantly with the stroke color applied to the 4 images earlier), also extracting it from the flower with the Eyedropper Tool. Since the final result of the collage appeared appealing, I did not attempt to add a frame to it! Tip – if the border margins appear uneven, edit in Photoshop using the Crop Tool if you know how, otherwise edit (crop) in Microsoft Office Picture Manager later when the collage is saved as jpeg format. Hope this collage tutorial had been helpful and you have fun in making your very own creation! You may want to read a collage tutorial by Adobe, which includes resizing, repositioning and rotating using Photoshop which was absolutely foreign to me before preparing this tutorial of mine! Something new to learn for me too! For the time-being until I’m more familiarised with Photoshop, I’ll stick to Microsoft Office Picture Manager for resizing and cropping photos. Though I’d love to know how to reposition images in a collage with precision in Photoshop. Sometimes, I just need to nudge an image very slightly when I prefer a tiny margin between images, but impossible with the Move tool alone! I’m sure there is a method to do it which I’m unaware of now! Hope someone out there can share their success in this area, otherwise I’ve to learn the hard way….?? Yippee! :D I’ve just discovered how to reposition images in a collage when only a very slight nudge is needed and cannot be achieved with the Move tool! Follow Step 8 as above but instead of using the Move tool, choose Edit > Free Transform. At the option bar that emerges at the top of the screen, increase or decrease the number of px at X or Y, or click at the triange icon to use relative positioning as desired. Then click the check sign (or Enter key) to commit transform or click the circle with slash (or Esc key) to cancel transform. Tip – Once the image is nudged as desired, the rest of the images in that single file can be easily repositioned with the Move tool. Just learnt too that cropping images in Photoshop using the Crop Tool from the tool bar (or tap C) is so easy! Drag the Crop Tool over the part of the image you want to keep to create a marquee. The cropping marquee doesn’t have to be precise as you can adjust it later by dragging any side handle. To complete the crop, press Enter (or double-click inside the cropping marquee or click the Commit button in the options bar). To cancel the cropping operation, press Esc (or click the Cancel button in the options bar).